I drove both these cars in Germany a couple of months ago, and I’ve been waiting eagerly to hurl them around the BIC ever since. Well, one of them anyway (no prizes for guessing which one). Okay, I’ll give you a hint – it’s the one that tips the scales at 1,585kgs, not the one that weighs in at 2.6 tonnes. Yes, the GL 63 AMG does share its powertrain with the E63 – which completely won me over when we brought it to the track a couple of months ago. So, yes, it does have the same 5.5 litre bi-turbo V8 under its substantial bonnet – which puts out a not inconsiderable 550bhp and 760Nm of torque. But is it really usable – and that too on a racetrack? Come to think of it, at the other end of the scale, the CLA 45 AMG has a fairly diminutive 2.0 litre four-cylinder engine – the first for an AMG! Yes, it’s the most powerful four cylinder in the world, but that could be the equivalent of saying it’s the healthiest item on a McDonalds menu. The question is – do these cars really retain that all-important AMG DNA? Well, that’s what we’re at the BIC to find out. First up is the GL 63. Now, we brought a couple of SUV’s to the track not so long ago. So, you could say that I’ve gotten used to getting a good view of the track from relatively high up. But this is in a completely different league altogether. At first, it felt like I was hustling a small country house around the track. But when you actually start pushing this car (correction: beast), you realize that it’s surprisingly well behaved on the track. The massive 295 width 21-inch tyres have such a massive footprint that they provide an unbelievable amount of grip. Of course, the power is addictive (as power is known to be). The first time I drove the GL 63 on the road, and stopped at a traffic light, I thought an E63 had pulled up alongside. After all, I could hear that distinctive AMG burble – but it was almost inconceivable to imagine that it was actually coming from under the hood of the massive machine that I was piloting. But, of course, it was – and the powerplant is just as effective in this as it is in the rest of the AMG range. The GL 63 shoots to 100km/h in under 5 seconds, and at the end of the 1.2 kilometre back straight of the BIC it managed to exceed 200km/h. The trouble with achieving that kind of speed, of course, is shedding it for the forthcoming corner. Luckily, the AMG brakes have adequate ability to reign in 2.6 tonnes travelling at illegal speeds. Naturally, the response of the much smaller CLA on the brakes was on another level completely. If you look at the performance graph, you’ll see that the GL (amazingly) almost keeps up with the CLA under acceleration – it’s under braking and mid-corner that it loses time, which is the penalty you pay for carrying an extra tonne of weight around the 16 corners of the BIC. The surprising thing, though, was the speed you could carry through most corners. The body control of the GL was excellent and the turn-in was pretty good. The firm suspension – which does feel a little too firm on our streets – performed miracles around the track. And while the AMG 7-speed was, once again, a little too slow to respond, the engine provided enough grunt for the GL to overshadow the lap time achieved in the brand new BMW X5 by almost 8 seconds. If I’m honest, I expected the GL to feel unwieldy and disjointed at the track – but it just didn’t. It felt beautifully engineered, very stable, and very fast. Don’t get me wrong, this is not a track car by any means. It’s big and heavy no doubt, but if you do have the need to ferry the family dog around at lightspeed, and perhaps even set a lap time while you’re at it, this is the machine for you. Now, clipping apexes and climbing curbs in a GL is pretty exciting – but let’s get serious, shall we? It’s time for the CLA 45. Almost exactly a year ago we brought the A Class hatchback to the track, and we all agreed that the A Class was the best handling front-wheel drive car we had driven around the BIC. Suffice to say, the car handled very well indeed. The CLA, of course, is built on the same platform. The AMG, however, sends power to all four wheels – in as much as the fact that it puts all its power down through the front wheels until it senses some slip, at which point it can send up to 50% of its torque rearwards. The power and torque figures themselves aren’t typical AMG fare, but they’re not inconsiderable either – 355bhp and 450Nm of torque. When I drove this car a couple of months ago, I realised very quickly that I would be underwhelmed if I drove it with a preconceived notion of what an AMG is – which is to say a German muscle car with a fire breathing motor under the bonnet. The CLA is a very special machine, but not in the traditional AMG sense. It has a 2.0 litre turbocharged engine that produces almost 180 horsepower per litre. It races to 100km/h in 4.6 seconds, and it responds best when you grab it by the scruff of its neck. On the track, it’s an absolute joy – it’s as simple as that! Naturally, everything is relative, and it felt like the most responsive machine I’ve ever driven after I jumped out of the GL. But, in all seriousness, it truly does feel that way. The chassis does an incredible job of putting the power down. The power itself is quite considerable. The engine wants to race to the redline every opportunity it gets, and it’s simply explosive above 4,000rpm. There’s just a hint of turbo lag. But on the track it’s very easy to keep the revs up, so you don’t notice it at all. The brakes, as mentioned before, are instant – as is the steering. This car simply goes exactly where you point it with no delay or fuss whatsoever – no matter what the speed (unless you push too hard going into a corner that is, at which point you do get a little initial understeer). The rear end comes around just enough to give it completely neutral handling. Sure, you can’t smoke the tyres at every corner like you would in a traditional AMG, but this is one of the easiest (fast) cars I’ve ever driven at the track. But it’s not just at the track that the CLA excels. When I first drove it in Germany, I wasn’t sure how it would do on our roads. Would it be too stiff, too nervous? Well, I suspected it may have been. But en route to the track, I drove it in Eco and Comfort modes – and it was extremely usable. The ride was composed on even the worst tarmac, and it came across as being an ideal daily driver. Well, it doesn’t get much better than that. Except that it does every time you lay your eyes on this stunning machine. Of course, when you get into the cabin of either of these machines, you immediately feel that unique sense of security which only a Mercedes provides. 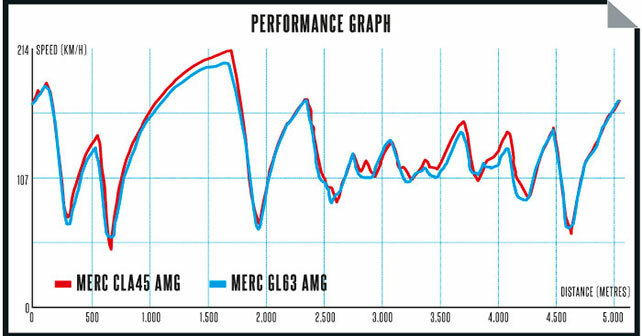 The AMG engineers have performed miracles with the GL, and they haven’t done too badly with the CLA either. Now, I just need to figure out which bank vault is constructed less well than a Mercedes body shell – because, one way or the other, I must have a CLA!